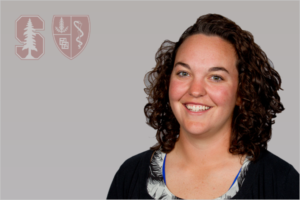 In August 2011, Lee joined Stanford Sports Medicine as a graduate assistant while attending San Jose State University in the Masters in Athletic Training Program. While here as a graduate assistant Lee worked with Men’s and Women’s Cross Country and Track and Field. After the two years as a graduate assistant Lee was hired as an Athletic Training Fellow. She began working with Football and Women’s Water Polo. After a year in the fellowship Lee was promoted to an Assistant Athletic Trainer. She continued to work with football and women’s water polo. Lee was recently promoted to Associate Athletic Trainer and currently provides direct medical care to the Women’s Soccer and Women’s Water Polo teams. Lee is vastly involved in the daily processes and function of the athletic training room. She oversees all of the inventory, ordering and budget for Stanford Sports Medicine. In the summer of 2015 Lee developed and successfully launched the annual Stanford Sports Medicine Summer Camp. As the Director, Lee manages all logistics highly educational and tremendously enjoyable camp for the high school students. She is also involved in the internship program at Stanford and a mentor for athletic training fellows. Prior to arriving at Stanford, Lee was an intern athletic trainer at Washington State University with their football Team. Lee graduated from Washington State University in May of 2010 with a bachelors in athletic training. Lee is originally from Lynnwood, Washington. She enjoys hiking, running, the outdoors, and baking.